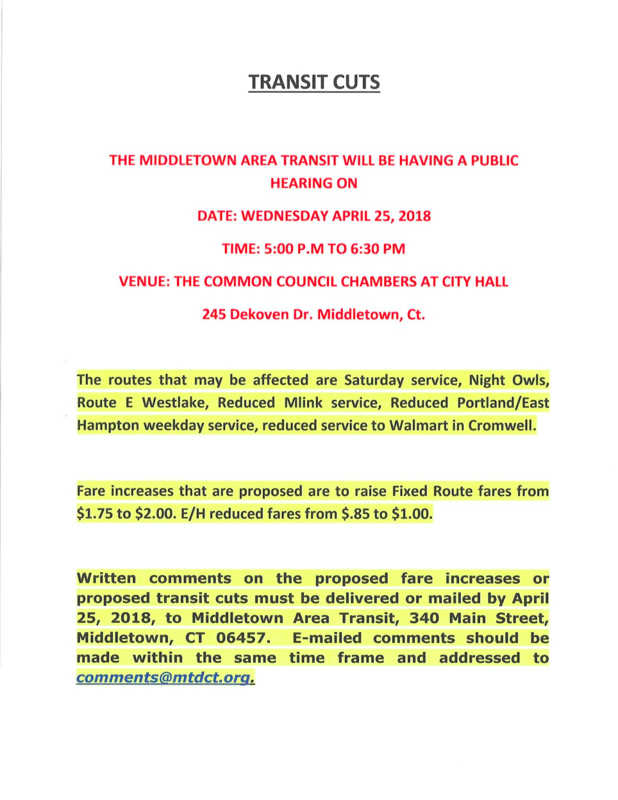 Today I received news from a Middlesex College Student named Gary Lambert that there is going to be a demonstration against imminent budget cuts to Middletown Area Transit (MAT) this Wednesday, April 25th at the MAT bus terminal on 340 Main St. The demonstration is starting at 4:30 PM. At 5, demonstrators will be walking to City Hall, where state representatives responsible for the cuts will be conducting a town hall meeting. 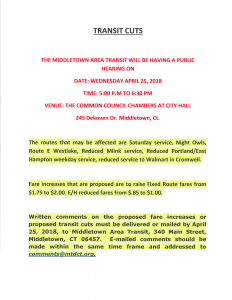 The organizers have asked for Wesleyan students and faculty to show up in support, as many people in Middletown rely on MAT to get to work, school, and to be mobile. The whole thing will not take more than an hour and a half, and it will be possible to leave early. Please, come out and support! The demonstration is supported by the Connecticut Parents Union, Saint Vincent DePaul, and Middlesex Community College.